No need to ruche around; the perfect tall boot is right here. The Galina Boot features a ruched stretch back for a flattering silhouette that will accommodate a variety of calf sizes. A rubber outsole with our proprietary Grand.ØS technology provides all-day comfort. Leather upper with ruched stretch back. Full rubber outsole with welt and Grand.ØS technology. I love this boot. Not only is it classy-looking, it is extremely comfortable. The boot was tight around my calf but after 3-4 wears, it has stretched out and gotten better. Also the material around the calf is stretchy. The shoe part itself fits normal. I have narrow feet and in Nike’s I wear a size 9 tennis shoe. I got the boot also in size 9. I highly recommend these boots, especially for ladies with smaller legs. These are the first boots I’ve found that fit so nicely!They are super comfortable and versatile - cute with dresses and jeans. Comfy boot and very stylish. Love that the boots hug your leg. I love my new boots! They’re are stylish, but also classic. The fit is true to size and they hug my calves comfortably. I’ve received a ton of compliments when wearing them. Nice looking boots. True to size, but slim fitted, especially compared to other Cole Haan boots which are generously sized. Looks and feel great with skirts and tights, but find it to squeezed to wear over skinny jeans. Find them flattering, with comfortable soles. Recommend these. I love these boots. They are soft and durable. Perfect fit. I usually need to order wide. These boots have a nice stretch. Love them wear them almost every day with my skirts. These are beautiful boots with great detail. I get compliments every time I wear them. Very comfortable as well! Thank you Cole Haan! Excellent boots. Love wearing them. Finally found a really cute boot that fits my narrow calves! Looks great! I am so in love with these boots. They are extremely comfortable and fits my shoe and leg like a glove. I have slim legs so finding boots that mold to them is difficult. I work in the city so for walking they are perfect. They go with anything. My daughter even loves them. They are a definite bargain and do not disappoint!!! I do love these boots. Very well made, a bit dressy, true to size, and they were comfortable from the first wearing. I am short and the height of the shaft is just right for me. I would highly recommend this boot. Awesom fit and look - highly recommend! this boot is probably great for women with normal and thin-sized legs, but for those of us with "athletic" or thick calves, this boot does not work at all. I know that's the thought with the ruching. But there is not near enough give. I am not obese. I just have big legs. I struggle all the time finding wide shaft boots and I really, really, really wanted these boots to work. I can't be alone. I was so disappointed. The stretch back seems to be the trend to solve the issue of shaft fit. It may be, but it doesn't mean manufacturers won't still have to put out wide shaft designs. It would be nice if they would. I waited till Black Friday to get these boots and I absolutely love them. I am a petite person with narrow feet and have an extremely hard time finding boots that fit my legs while also fitting my narrow feet. These boots do both! I wear them almost everyday for work, they are so comfortable.The sizing was a little weird,I am normally a 7 and got them in a 6.5 but besides that I def. recommend getting them! These boots are great. They can be casual or dressy. I love that they fit snug on my calf. I have almost comically skinny legs, so finding a nice boot has always been a struggle for me. No more! These boots are gorgeous and fit my legs SO well. They will look awesome with jeans, skirt, dress, you name it! Very versatile boot that looks great tucked in jeans, with trousers, skirts, or dresses. Loved these boots. Very comfortable and the finish is of great quality. Great boots. Comfortable and fit my wide calves perfectly! These boots are absolutely stunning in person. 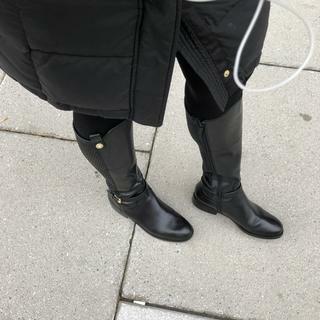 I initially bought these because I have trouble finding boots for my narrow calves and wanted a boot where I didn’t have to wear leg warmers. I would definitely get a 1/2 size up for comfort. The only thing I would say is a con is the bottom of the heel isn’t rubber and seems like it may get damaged more quicker. However I bought these boots hoping they last me years. I’m super picky with comfort because I’m on my feet all day and these are just the best! I love how sleek they look too. Worth every penny! Love my Galina boots! So comfortable and stylish. The heel is not high at all which makes it easy to walk in all day long. I would highly recommend them. These boots are sleek, elegant and comfortable. Get yourself a pair. You won't regret it! I have slim calves and these fit well. They don't gap. Love 'em. Shoes are comfortable and look great!!!!!!!!!!!!!!!!!!! love the style of this boot - the footbed is too narrow for a M width . I don;t have wide feet, but will have to get them stretched as the first time I wore them my little toe went numb! Soft and comfortable. Usually 7 1/2 . Got an 8 fits perfect . I love these boots! They are absolutely gorgeous, very well-made, and so comfortable I can wear them all day long and my feet still feel great at the end of the day! Order a half size up, as these do run a bit small. Comfortable “grand” insoles; stretch in calf; great classic styling. No need to break in- soft and comfy! Very stylish, comfy, great quality. Boot comes under the knee, has a classic style and the the mix of materials gives it some panache. look comfortable and different from typical riding boots, yet classy. Hoping the stretching material will fit my calf. saw in macys , they were out of stock. I'm 5'1'. I wear just under a 5. Hoping these will work for me. I haven't received the boot yet, but I chose this because it says it ran small. I don't have big calfs and want a boot that fits snug. I like the style. I can't wait to wear it. I have been looking for a black boot that are knee high.. I have 2 other pairs of Cole Haan boots that fit well. It looks like a classier riding boot that I could wear to work with a dress and tights. Plus, I have narrower calves and this boot looks like it'll be more fitting for narrower calves. I saw them in person at the mall and loved them but they did'nt have my size so I ordered them online. I chose this item because I wanted the mix of casual/classic look in a boot that was not above my knee. sleek design, look and comfort. Would have liked this better if it was over the knee with same heal size and design. I purchased a pair of Cole Haan boots about 5 years ago and I fell in love with the quality, style and durability. I still own those boots and I get compliments every time I wear them. I have been looking to replace my current Cole Haan boots. I tried this in store and it fit around my calf and looked great. I didn't purchase at the time because they didn't have my size or a deal so I've been waiting for these. My wanted the Simona Tall but it is not available in black in her size. I'm hopeful they will fit my small calves! Loved the look of them! I have narrow calves and these boots seems great because they stretch. Is it waterproof and a snow boot? BEST ANSWER: No, it’s not waterproof. You will want tp winterize yourself. This isn’t a snow boot. Cole Haan has a tall suede waterproof boot that may be available this fall. I wear a size 6 in the Studio Grande shoes- a bit snug with socks. Will I n ed 61/2 in boots? BEST ANSWER: Yes, they run a half size small. I am normally a size 7, but a size 7 1/2 in these boots fits me perfectly. Approximately how much will the stretch back stretch to accommodate wider calves? BEST ANSWER: For Galina: measurements vary slightly by size, click on 'Size and Fit' tab to display the chart of boot measurements/calf girth. We also have a selection of boots that are available in extended calf sizing. Type "extended calf" in search bar to view the current styles available today. EC sizing will provide the most room in calf girth/circumference. BEST ANSWER: Yes, there is a zipper on the inside. These are extremely comfortable and the flexible backing allows for a nice snug fit around the calf. Yes, this boot zips on the interior side of the calf. Yes, the zipper goes all the way down. If I get a size 8 1/2 and I have a 15.5 calf would these boots be out of the question? I know it says 14 3/16, but I am hoping they'd stretch and the side zipper would help. BEST ANSWER: I just measured my calf for you...I am 15.5 too and I can wear them. They are snug but still comfortable. The entire posterior of the boot is stretchy so it works. Hope this helps! I think you can. I have big calves too and can never find boots that are big enough for them. These stretch enough for my calves. I love them. I bought both colors. The back side of the boots are quite stretchy. I think they will work for you. Best of luck. be tight. The back is stretchy but it will make indentations on your calfs that may be uncomfortable. Good luck! I don’t know about exact measurements, But I have very large calves and these are the only boots that fit well. I have them in brown and black. It’s a pretty narrow calf style and I would worry that the zipper would not hold up over time even if it closes. However, it’s a lovely boot. The leather does have some give over time but not a considerable amount in my experience. It may be too snug. I think they would be fine. The material in the back streches. I truly love these boots! They Are true to size. Very nice fitting and stylish boot. I love them. What color is the metal trim on the black boot? Gold. Beautiful boots and super comfortable. The metal trim is gold-tone. It seems to come to the knee on the model. I'm only 5'2" (size 7 shoe) so will it still be under my knee? BEST ANSWER: I'm 5'2" and it comes right below my knee and has a little scrunch to it that makes it look so on trend. I highly recommend these! Yes! I'm 5'3 and size 6.5 shoe so I would assume it will be under your knee too. I am 5’2” and it is under the knee. It sounds like these fit narrow calves well...how about wider calves? BEST ANSWER: They work for thin and muscular calves due to the back stretch material. A flattering boot. If your calves are extremely muscular you might go up a half or full size since these run a bit small. I’m a runner with fairly narrow calves, and they are SNUG. Love these boots, but beware! It fits mine just fine. hi guys, i'm only 5 feet tall, will the front of this boot rub my knee? BEST ANSWER: Hi, I am only 5 ft and it does not. Rub the knee. They also dip a little in the back, so sits just below the bend in back. That was always my concern with buying higher boots is that I might be too petite, but this one is very comfortable. I think it depends on the length of your calf area, however I am 5'2" and the boots come up to about 3 inches below my knee cap, so no rubbing for me! Hope that helps! I’m 5 ft . I wonder if this boots will fall below the knee? I am 5'6" and this boot falls just 1/2 below the knee for me. How do you zip them if the zipper is on the inside? BEST ANSWER: The same way you zip them when the zipper is on the outside. These actually look better because the zipper is inside. Awesome boots! It just means the zipper faces in side, it’s not on the outside part of your leg. What does the mm mean in the description of the boot? BEST ANSWER: Mm means millimeters. For example, on our Tali Modern Bow Pump, style W11962, the heel measures 45 mm, or 1.7inches. For the Galina boot, the heel is approximately 1" or 25.4 mm. The Galina Boot is very good and comfortable boot, I like this boot very much. It’s the height of the heel in millimeters. Do fit big ankles ? BEST ANSWER: depends on the size of the ankle I suppose. I will say the the quilting provides a little bit of give and stretch. I would say no...these boots are snug on your legs. They are not waterproof. Visit our "Weatherproof" section to view styles that are waterproof. How tall & are they slip on? BEST ANSWER: They look great in- no you can’t slip them on there is a zipper inside . Do you have these in a c width ? BEST ANSWER: This style is available in B or Medium width only. To find currently available styles in your size/sizes and widths, you can use the drop-down filter tabs on the side of the shoe page to shop by size, width, color and more. Do these boots come in wide? BEST ANSWER: This style is available in Medium, or B width only. How do I return if they don’t fit? BEST ANSWER: Unless the item is a Final Sale style, any unworn shoe can be returned for credit within 30 days of purchase. For details on how to create a return, please see the link at the bottom of any web page. I need this item but not my size. Will there be a size available before the sales out? BEST ANSWER: Styles are selling out during the sale! Best options: select your size (even if sold out), click Find In Store, enter your zip code to see if your size is available in a store near you. If so, you will need to be present in the store to make the purchase. Other option: we have many great styles of boots, search boots by your size to find another alternative and take advantage of our sale! Is this made in China? BEST ANSWER: Yes, Galina is made in China. Please visit our FAQ section to learn more about, "Where does Cole Haan manufacture its products?" Does it bunch up around the ankle when walking like some boots do? And do you have to keep pulling them up? BEST ANSWER: The Galina boot is not a slouchy boot style. Depending upon the size of your calf, this boot should stand up is tall and straight, slightly hugging the back of the calf. Do you offer wide widths in boots? BEST ANSWER: At the moment, there are no tall boots available in wide widths, but styles are being added regularly. You can use the filter drop-down tabs on the shoe page to shop by size, width, color and more.